Soup is probably the ultimate comfort food. When you’re sick, your mom makes you soup. When it’s winter, you make soup. When you’re too tired or lazy to cook and need some quick sustenance, you heat up soup. I often like to make a big pot of soup on a Sunday afternoon so that my lunch is set for the rest of the week. Goodness knows when was the last time I had soup from a can—that lovely thick, gelatinous stuff (nothing like watching Chef Lynn Crawford a few weeks ago on her new show, Pitchin' In, jiggling an uncanned cream of mushroom soup on her hand) that’s laden with sodium, preservatives and artificial flavours. But not everyone has the luxury of homemade soup. Time is too precious in a world where we often find ourselves on the go, without a minute to spare. So it’s nice when we have an alternative to homemade soups that taste just like..well, homemade. Toronto-based Executive Chef Katherine Hall has created a line of vegan soups and stews. 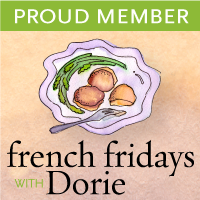 All her products are made with all natural, fresh ingredients that are locally sourced, contain no additives or preservatives, are GMO free and trans-fat free, made without any gluten, yeast or dairy products, and are a good source of fibre. A lovely jar of Chickpea, Tomato, Spinach and Lemon soup arrived two weeks ago (thanks to Chef Hall and Sizzling Communications) and I couldn’t wait to open it up. You could already tell from just looking at the jar how fresh and homemade the soup would taste. It was chock full of vegetables—Chef Hall definitely does not skimp on the ingredients! The soup is lovely on its own. You taste the freshness of the tomatoes, and the lemon and acidity of the tomatoes add a nice zing to the soup and really brightens the overall flavours. The chickpeas are cooked perfectly—not the typical mushy beans you might find in canned soup, but with still a bite to them. The soup made a fabulous lunch on a cool rainy day. 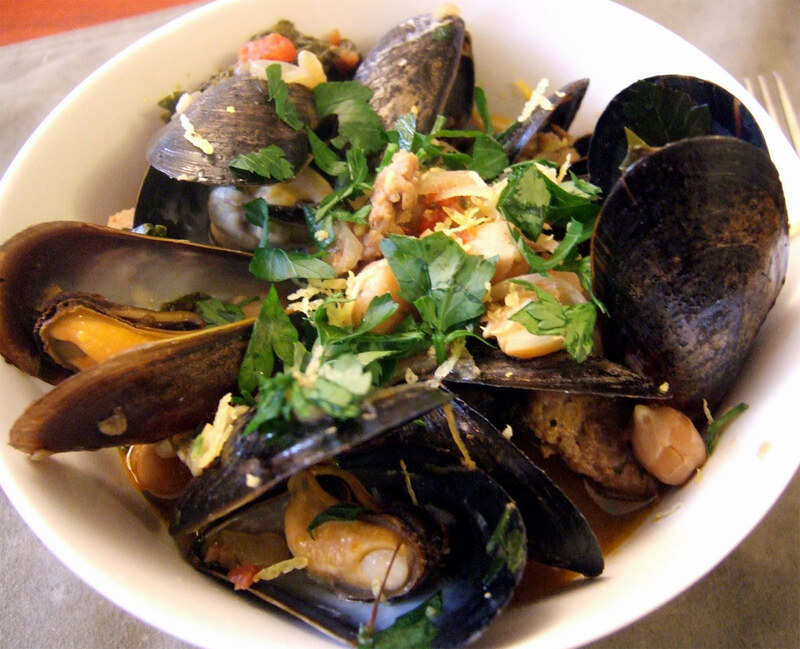 But steam the soup with some mussels and chorizo, and you’ve got a quick and impressive meal. The spiciness of the chorizo adds another layer of complexity to the flavours, and the lemon and tomato in the soup really help bring out the natural sweetness in the mussels. The soup will also have more depth of flavour with the addition of the mussel juices, making for an incredibly irresistible broth. 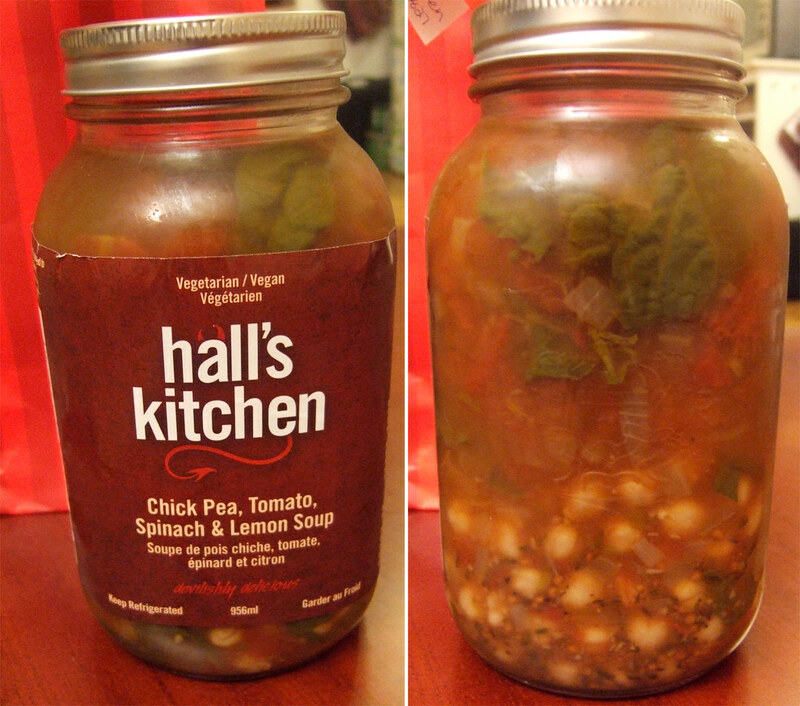 Hall’s Kitchen soups and stews are only available in the Greater Toronto Area for now. Click here to find out where you can purchase your own jar of soup or stew. Heat 1 tablespoon olive oil in a large heavy saucepan over medium heat. Add the shallots and garlic and sauté until shallots start to soften, about 2 minutes. Add the chorizo and sauté until they start to take on some colour, about 5 minutes. Add a good splash of white wine, then add the soup, mussels, and red chilli flakes if using. Increase the heat to medium-high and when the soup has come to a boil, reduce the heat again to medium, cover and let steam for 8 to 10 minutes, or until the majority of the mussels have opened. Season with salt and pepper to taste. Remove from heat and discard any mussels that have not opened. 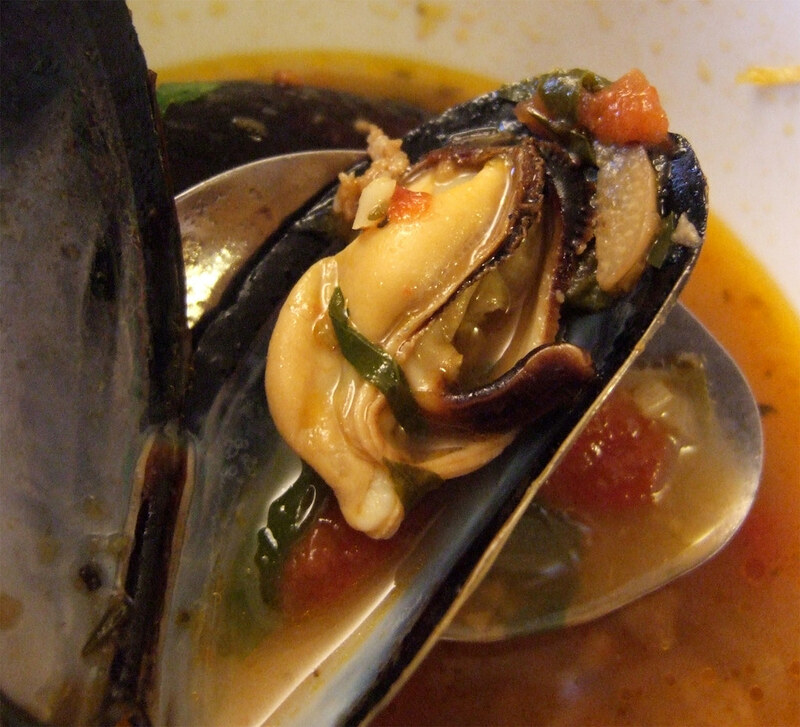 Divide the mussels and broth in two dishes. Garnish with chopped parsley and some lemon zest. Serve immediately with lots of crusty bread to soak up the delicious broth! Don March 25, 2010 at 10:30 p.m.
A great quick meal idea Bonita! Eleanor Hoh March 25, 2010 at 10:43 p.m.
Looks very mouthwatering. Where do you find time to do this? Chocolate Freckles April 1, 2010 at 3:17 p.m.
Ohhh this is mouthwatering indeed!! .. Where do you buy your seafood?? I am also from Toronto..